"The term hippotherapy refers to how occupational therapy, physical therapy, and speech-language pathology professionals use evidence-based practice and clinical reasoning in the purposeful manipulation of equine movement to engage sensory, neuromotor, and cognitive systems to achieve functional outcomes. In conjunction with the affordances of the equine environment and other treatment strategies, hippotherapy is part of a patient's integrated plan of care" (American Hippotherapy Association). 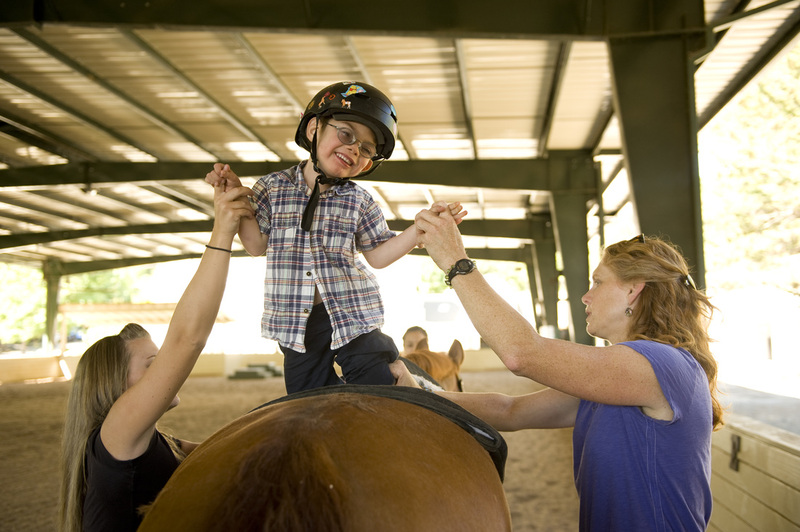 Hippotherapy incorporates OT, PT, and Speech Therapy in a equestrian setting and allows children to engage in multiple styles of movement. Hippotherapy literally means "treatment with the help of the horse" from the Greek word, "hippos" meaning horse. Hippotherapy is a fun way to get PT, OT, and Speech hours. Students get to explore a new, fun, exciting, activity! This link brings you to the AHA approved curriculum for educators. "The hippotherapy team of horse, client, side-walkers, therapist and instructor is a wonderful example of a symbiotic relationship." "Embracing the therapeutic value of horses has become increasingly popular in the field of occupational therapy to achieve a host of motor, sensory and psycho-social objective." How does it help for occupational therapy? Allows for students to achieve occupational hours and goals through a new outlet! Uses games and activities while child is riding the horse to work on goals of the session that the occupational therapist sets up (on a case by case bases). Uses horses to work on fine motor skills! What are the target goals for each session? Each goal is different depending on the child and what their IEP has and their previous assessments regarding their OT goals and plans. What are some of the activities that the child does with the horse? How does this help children? How does it help for speech therapy? Hippotherapy uses a horse to accomplish traditional speech, language, cognitive, and swallowing goals. Carefully modulated, rhythmic, balanced equine movement offers an effective means of addressing speech and language deficits through facilitation of the physiological systems that support speech and language function. “walk on” or “go” is often as much of a triumph as the ability to sit upright, move toward independent functional mobility, or succeed at a game. The primary goal for speech therapy is for them to have the ability to communicate while riding the horse, whether that be to the therapist or to the horse. It helps students use their expressive language while still maintaining and achieving other goals set in their IEP. Gives a unique way to enhance speech abilities in a physical and fun way. Looks at the physical aspects of hippotherapy and uses that to help enhance speech in student. How does it help for physical therapy? PT Hippotherapy helps students with large motor skills and "Development of body systems and interaction with the development of movement (Introduction to Hippotherapy). Can help individual students with their target goals (that are set in the beginning of the year in their IEP). Goals of the session differ per student but all goals are relatively the same in each session which looks at large motor skills and most likely posture. -go around arena and grab props (during this time have the student have a straight posture and lean in to grab the prop or to drop it in the bucket). - Proprioceptive -- heavy touch pressure through the hip, knee, wrist, elbow and shoulder joints in the quadruped position. - Motor (physical) -- stability of hips and pelvis required to maintain position while reaching forward with one hand. Helps children achieve their PT goals. It allows them to meet their goals and help with motor skills and posture through a fun and unique activity. Gain better posture and motor skills and achieve the goals that were set up for the individual child.